Natural look of wood. After installation wood fence can be stained or painted in any desired color. Available in wide range of styles and designs. Most popular colors are white, grey, and brown. Good choice for residential property. Wood is a good low cost material for building security fences. Many vinyl fences are not designed for security purposes, but some products have a high level of security. Depends on fence design, but pressure-treated wood is a good option for building privacy fences. Solid vinyl panes are a great material for building privacy fences. Very susceptible to open fire. Vinyl fences have fair resistance to impacts and could be physically damaged. Termites can easily damage the wood fence. Vinyl fences do not rot. Pressure-treated wood is durable material, but can be damaged by heavy abuse. Vinyl fence is fairly durable, but can be physically damaged. 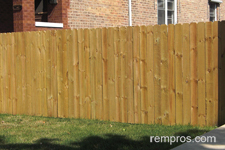 Pressure-treated wood fences have shortest lifespan compare to other fence materials. Often should be replaced in 10 – 15 years. With adequate care quality vinyl fence can last over 25 years. Normally do not require much of a care besides regular cleaning. One of the cheapest fencing materials. Prices for vinyl fences widely vary, but typically it is more expensive material compare to pressure-treated wood fence. Charges to install one linear foot of pressure-treated wood fence are lowest compare with any other fencing options. Labor fees for vinyl fence installation could be slightly higher in comparison with building wood fence. Building a wood fence is one of the easiest tasks. Installation of vinyl fence is not a hard project. Building 50 – 60 feet of standard pressure treated lumber fence with simple 36” wide gate typically is a couple days project for a crew of 3. Crew of three normally is able to install 65 - 70 feet of vinyl fence in 2 days. Wood fence is easy to repair. 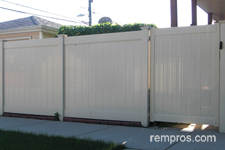 Damaged sections of vinyl fence can be easily replaced with new ones. Fence posts installed too far from each other (normally distance should be 8 feet in between wood fence posts). Fence posts inadequately set into the ground. Wood starts rot because of skipping periodical maintenance. Poor built and mounted gates. Improper installed posts. Discoloring of vinyl fence normally happened because of low quality materials itself or poor maintenance. Pressure-treated wood and vinyl are good fencing options with their own advantages and disadvantages. Wood is very easy to work with material and pressure-treated fence is very affordable what makes it even more attractive to many homeowners. Vinyl fence typically last longer and require less maintenance in comparison with wood fence.